It is a connection from not so very long ago, but it is a link which has already become swathed in legend, myth and hearsay. Just how strong is, in fact, Whitburn’s claim to be the source of inspiration of so much of Lewis Carroll’s genius works of child fiction? Carroll certainly visited the town on a regular basis: on the occasions of his visits to his relatives, a Mr and Mrs Wilcox – the former being his uncle, the latter his cousin. He stayed at their residence in High Croft, Lizard Lane, and would often also visit the Williamsons at Whitburn Hall – who themselves often entertained their child relatives, among them the famous Alice Liddell. The writer would often entertain the younger members of the families with which he stayed by utilising his imaginative story-telling skills. He would undertake walks in the nearby woods and along the local beaches, and weave his experiences into tales and poems – ditties and yarns which would often find their way into published works such as the Alice books in later years. Hence Whitburn’s claims for its expansive beach and the roots of The Walrus and the Carpenter, and that of Jabberwocky in the local legend of the Lambton Worm. Jabberwocky was, indeed, most probably first narrated to his little friends at Whitburn; and it is now generally accepted that The Walrus and the Carpenter was written during one of Carroll’s stays in the town, too. However, various (rather more direct) Walrus connections to the area have yet to be proved beyond doubt – the appearance of a stuffed animal at Sunderland’s Museum certainly seems to have occurred after, and not before, Carroll got lively with his imagination. There is some evidence, however, that he may have encountered such a rigid incarnation at his sister-in-law’s house, Southwick Rectory, around 1869. There is something rather pleasing about the uncertainty, nay, daftness, of it all. More Carroll nonsense (actually, a very eloquent piece) can be found here. 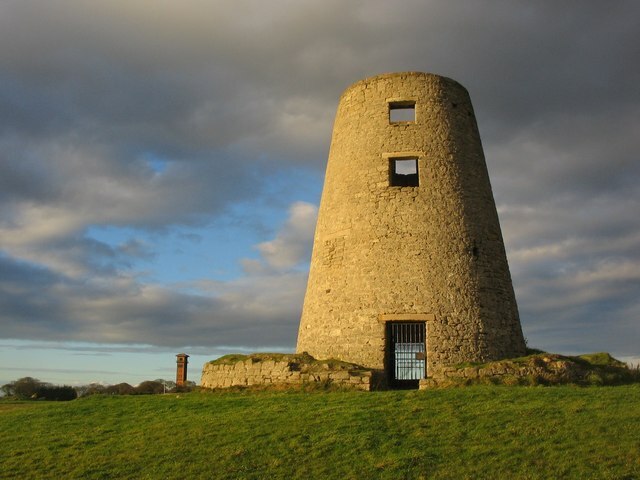 Situated on its lofty perch atop the Cleadon Hills, this ruined windmill was probably constructed in the 1820s – though an earlier construction may well have occupied the blustery site. It is likely to have fallen out of use after it was damaged by a storm in the 1870s, for it is not mentioned in directories after this time. During World War I it was used for target practice, though it has since been partially restored. In the late 1970s, what was left of the mill’s internal machinery was removed, and the entrances barred. The ruin is said to be haunted by the ghost of Elizabeth Gibbon, a miller’s daughter who threw herself from the top of the mill tower after suffering a broken heart. The windmill was actually operated by a family of that name at the time of the 1870s storm, so maybe the story is true, if not the ghost. Despite the structure being Grade II Listed, there is a threat that it may be demolished soon – if rumours on the Internet are to be believed. For some beautiful images of Cleadon’s landmarks, see here. 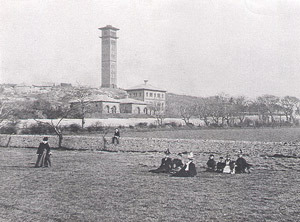 Looking much the same in 1900 (above) as it does today, Cleadon Water Tower was built during 1859-62 as part of the water pumping station of the Sunderland & South Shields Water Company – an organisation which itself had only been formed after an Act of Parliament of 1852. The plant fell out of use years ago, but the tower and many of the outbuildings remain, having found alternative uses. The tower is, in fact (or rather was), a chimney for the old steam-powered pumps which drew clean water from the depths below. The well itself, one of several in the area, was 12ft in diameter and 258ft in depth. Strangely, little is known of the pumps which drove the station – they were removed in 1930 when the plant was electrified. The elegant Italianate brick construction was designed by Thomas Hawksley and was typical of its day. It is 100ft tall, with a balcony near its summit, and is visible for miles around. An internal staircase spirals around the chimney’s central flue – a void now largely filled with radio aerials and the like. © Copyright malcolm tebbit and licensed for reuse under this Creative Commons Licence. When it commenced operations in 1871, Souter Lighthouse was the most advanced in the world. Designed by James Douglass, it was the first to use electricity. The 800,000 candle-power light was powered by a steam engine from a dedicated engine room. 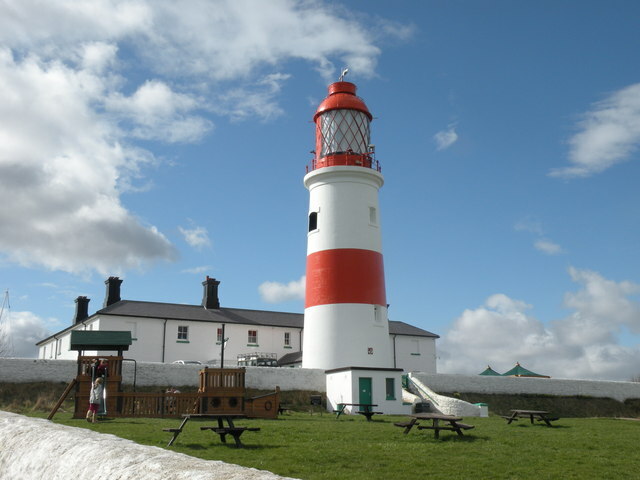 Though located on Lizard Point it somewhat strangely takes its name from Souter point a mile to the south. It was, in fact, the intention to build the lighthouse on the latter site, but this was changed at the last minute due to the lie of the land. The original name, however, was retained – though this was thought to have been done to avoid confusion with Lizard Lighthouse in Cornwall. Though decommissioned in 1988, the lighthouse is still fully operational – with engine house, light tower and Victorian Keepers’ Cottage all open to the public under the guiding hand of the National Trust. It is, of course, haunted. The official website can be found here. As for the ghost, try here. Before 1874 there was nothing, and after 1970 there was nothing. But in between thrived the cliff-top colliery village of Marsden in the narrow band of greenery which now exists between the main road and the coast, immediately north of Souter Lighthouse. You can barely imagine it ever existed today, but it very much did. 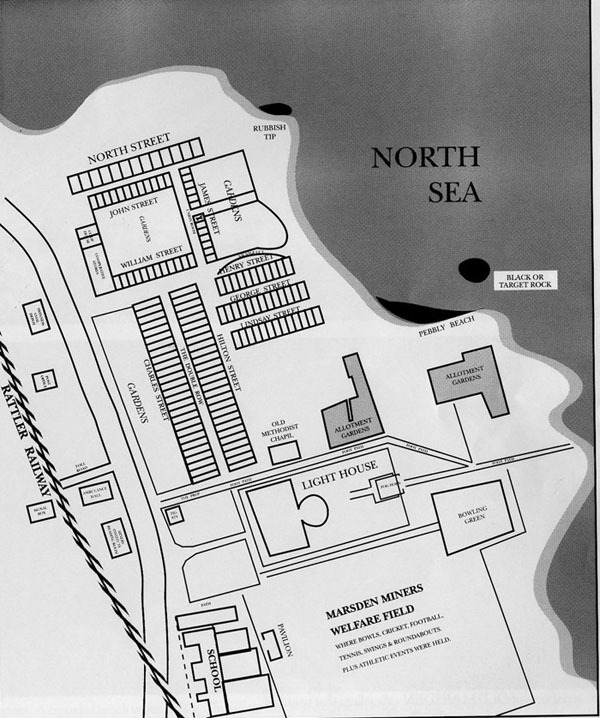 And it all began, as it so often does, with the sinking of a couple of coal shafts – on this occasion by the Harton Coal Co. – in the shape of Whitburn Colliery, a few hundred yards to the south of the future village. The labour demand for both this and the emerging limestone quarries and lime kilns in the area necessitated the construction of a new settlement, and thus the brand new village of Marsden was born with its 135 houses set out in nine rows. The inhabitants of the ‘new town’ were well catered for. All had gardens or allotments, there was a post office, a Co-operative store, two chapels (Anglican and Methodist), a Miners’ Institute & Reading Room, a sports field, and a school. The famous ‘Marsden Rattler’ connected the villagers’ tiny railway station – said to be the smallest in England – to the rail network, and carried the men to and from work. At its peak around 700 folk lived there. After doing very nicely for a good half century, one by one the local industries began to disappear during the 1930s, ‘40s and ‘50s, and employment opportunities began to wane. In 1968, the failing Whitburn Colliery finally closed, by which time Marsden was already in decline. The decision was then taken to entirely dismantle the village as part of a beautification process – and almost everything was swept away in a very short space of time. Only the old school building and a chapel were left standing. (taken from www.bornyesterday.org.uk/old_marsden.html - not sure who owns the copyright). Marsden Limekilns, facing bleakly out to sea at the southern extremity of Marsden Bay, are one of only three Scheduled Ancient Monuments in the Borough of South Tyneside, the other two being Arbeia Roman Fort and St.Paul’s Monastery. They are unmissable to anyone using the present-day A183 Coast Road. The massive creations date from the 1870s, being an off-shoot industry of the nearby (but long gone) Whitburn Colliery. 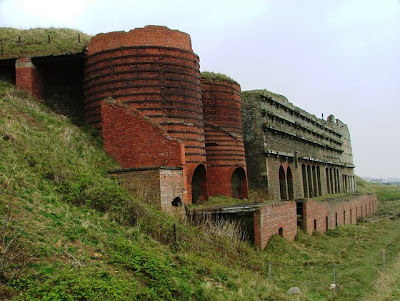 The limestone which was processed in the kilns was quarried literally yards away on the clifftop above, the stone being fed into the top of the complex. Coal from the nearby pit fuelled the kilns, heating and breaking down the stone to produce quicklime, which was used to neutralise soil, and also had uses in the cement, steel and chemical industries. The kilns to the right pre-date the circular affairs to the left, the latter being added in 1895. The insertion of the raw material at the top and the extraction of the quicklime at the base was almost continuous when the kilns were operating full-pelt. A railway line at the front took the goods to South Shields for shipping. When the colliery closed in 1968 the limekilns went with them, their source of power gone. 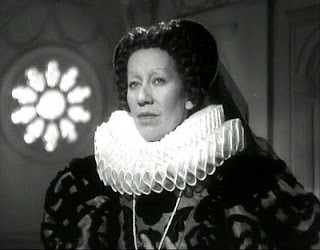 Flora McKenzie Robson, one of the twentieth century’s greatest character actresses of stage, film and TV, was born at 11 Village Terrace, Westoe, on 28th March 1902. Her father, a shipping engineer, relocated the family to the south of England in 1907, where Flora spent most of the rest of her life. From the age of five she competed in recitation competitions, eventually attending RADA as a youth. Lacking what may be described as ‘glamorous looks’, Robson took on character roles from an early age – a career decision which was to see her excel over the following decades, though her fame didn’t begin to surface until the 1930s. In fact, such was the uncertainty of her ‘trade’ that she spent several years employed as a factory welfare officer in east London in the 1920s. The early 1930s, however, began to bring real stage success – based largely at the Old Vic. In time, film roles followed. Most notably, of course, were her two performances as Queen Elizabeth I in Fire Over England (1937, picture above) and The Sea Hawk (1940); but memorable roles followed in Saratoga Trunk (1945 – Oscar nomination), Caesar & Cleopatra (1945), Black Narcissus (1947), and the ‘Holiday Camp’ series of films. A host of stage, film and TV appearances followed throughout the ‘50s, ‘60s and 70s. Many will remember her for her role as the Queen of Hearts in the 1972 production of Alice’s Adventures in Wonderland, and her final film appearance as a Stygian Witch in Clash of the Titans (1981). Her largely unheralded charity work helped her to a CBE in 1952, then a DBE in 1960. She never married nor had children, and lived for many years before her death at her Brighton home with her two sisters. She died in 1984. This splendid institution turned 150 years of age in April 2010 and, though it’s a little late, let’s have a celebratory look back at its history. The building now occupied by the museum and art gallery was built during 1859-60 as the South Shields Mechanics Institute for the purposes of providing the working classes with a means by which they may educate themselves. Sir Robert Ingham, MP for South Shields and President of the Mechanics Institution, would have had quite a say in the matter, no doubt, and it was he who laid the foundation stone in 1859. Built at a cost of £2,700, the Institute was opened in April the following year, but proved too costly to run so was sold onto the Borough Corporation in 1871 for use as its planned Free Library. Eventually, in October 1873, the building was indeed opened as the town's first public library. However, within a few years the building began doubling up as a display venue for relics from the nearby Roman fort, and a move was made to open a museum within the building – a development which came to fruition in 1876. As the years went by, other artefacts would be added to the museum’s collection as seafarers brought items home from all over the world. The museum and library continued to share the building until 1976, when the new library complex opened in Prince Georg Square – after which the old building was rebranded as the ‘Museum and Art Gallery’. Since then, significant improvements have been made to the building, inside and out – most notably in 2001 and during 2003-4. Loved and respected by thousands of admirers the world over, Dame Catherine Cookson, author extraordinaire, died peacefully in her sleep on 11th June 1998 – a few days short of her 92nd birthday. She was arguably the greatest and perhaps the most famous living North-Easterner until her recent passing, selling more than 100 million copies of her 100 or so novels worldwide in 18 different languages. Though she didn’t begin writing until she was 44 years of age, for the last decade of her life she headed the list of the most-borrowed library books in the UK. She was awarded an OBE in 1985, and became a Dame in 1993. Catherine was born on 27th June 1906, at 5 Leam Lane, Tyne Dock, on the south bank of the Tyne, the illegitimate daughter of a tragic, broken alcoholic, Kate McMullen. For the first seven years of her life she was led to believe that Kate was actually her elder sister, and was brought up by her grandmother Rose McMullen and ‘step-grandfather’ John McMullen – whom she believed to be her real parents. Her biological father was one Alexander Davies (her birth was actually registered under the name of Davies), a well-to-do regular at the pub where Kate worked. However, Alexander had left the scene by the time of her birth - never to be seen again. Catherine endured a childhood of abject poverty – very much the norm amidst the docklands of Tyneside. Shortly after learning the truth about her parentage, she was molested by an Irish lodger who lived next door – at the time her mother’s boyfriend. Furthermore, she suffered regular beatings at the hands of the uncaring Kate, and endured a life of general drudgery. The family soon moved onto Jarrow in 1912, a house which was permanently filled with lodgers thus putting yet further strain upon the young Catherine. Five years later, in 1917, her grandmother, Rose, died – and Catherine herself, in fact, almost died soon afterwards as the wear and tear on her young body took its toll. But, pulling through, she determined to make good, and pushed herself through a series of self-improvement projects in her teens, despite her low social standing. Shunned by her boyfriend on her 21st birthday she decided to break her ties with the North and fled south – firstly to Essex, and then to Hastings where she found a fairly well-paid job as a workhouse laundry manageress. She scrimped and saved her money, only to learn that, to her horror, her mother, Kate, had decided to move south to live nearby. Catherine, however, was eventually able to take out a mortgage on a large house in 1933, and took in guests – keeping her mother at arm’s length in her old house in the centre of Hastings. One of Catherine’s lodgers, Tom Cookson, was to eventually become her husband – tying the knot, as they did, on 1st June 1940. Her mother returned in disgust to Tyneside. Suffering three miscarriages and a nervous breakdown, Catherine’s problems continued, however. She even spent some time in a psychiatric hospital near Hereford during the war, eventually returning to her Hastings home where she spent many a lonely night without husband Tom who was away on RAF duty. Suffering a fourth miscarriage, she eventually found solace in writing. Struggling for themes and a style, she began to make use of her own life experiences which finally found form in her first published novel, Kate Hannigan, in 1950. It earned her £100 – a huge amount of money in those days; but, more importantly, was to launch her on a career which was to bring her worldwide fame, and a fortune beyond her wildest dreams. The publication of Kate Hannigan was only the first step on the long road to fame for Catherine Cookson – who was, by then, already 44 years of age. Her life until then had been a one of perpetual heartache, it had seemed; and even throughout the early years of her new career her health remained a constant problem. She suffered a hereditary blood disorder all her life, and was in constant need of medical attention – and regular blood transfusions. Against the odds, though, she lived on, and on, and continued to write, and write. The money began to pour in as the years rolled by; and when authors began to be paid a fee each time their books were borrowed from libraries it was the making of her – though she donated her first year’s income from this scheme to less fortunate writers than herself. Indeed she was to donate millions of pounds to all sorts of charities and causes over the years. In 1961, writer’s cramp forced Catherine to start dictating her work. In 1968, she won the Winifred Holtby Prize for the Best Regional Novel for The Round Tower; and the following year one of her best-loved novels, Our Kate, was published. She was made a Freeman of South Shields in 1973, and was granted the Freedom of the Borough in 1974. In 1975, she and husband, Tom, decided to establish a base in the North-East and bought a house in Jesmond – but made the move north permanent in 1976 by buying a house in Morpeth. They later bought houses in Corbridge and Langley, Northumberland. Catherine was elected Variety Club Woman of the Year in 1982 (an honour later gained on two further occasions), and was named as Britain’s top creative writer by Woman’s Own magazine the same year. In 1983, she was awarded an honorary Master of Arts degree by Newcastle University. She achieved true national acclaim in 1985 when she was awarded an OBE. It was at about this time, too, that many of her novels started being dramatised for TV in a big way – The Fifteen Streets being perhaps the most famous, appearing on our screens in 1989 – and winning the Best Network Programme on TV Award. But in 1990 Catherine suffered two heart attacks – though she recovered, and enjoyed another honour in the shape of an honorary doctorate from Sunderland Polytechnic in 1991. The very same year she and Tom moved into a bungalow in Jesmond. On January 1st 1993, Catherine was made a Dame in the New Year’s Honours list – the ultimate accolade. By then she was a novelist of international repute. And in her native North-East there were permanent tributes to be enjoyed by all in the shape of, most notably, the ‘Catherine Cookson Country’ tourist trail (which effectively doubled the number of tourists to South Tyneside, Catherine’s ‘home patch’ of her childhood) and the permanent ‘Catherine Cookson Display’ at South Shields Museum & Art Gallery. Both attractions still bring in thousands upon thousands of Cookson fans to the region every year. 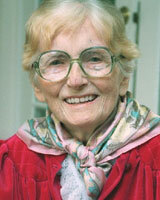 But perhaps Dame Catherine Cookson’s greatest legacy is her immense charity donations. £1million to Newcastle University for research into blood disorders; £100,000 to Jarrow’s ‘Bede’s World’; £224,000 to help Durham Cathedral display its ‘Treasures of St.Cuthbert’; £187,000 to safeguard the future of Newcastle's Hatton Gallery; Children’s Literacy in Newcastle received £163,000; South Shields Volunteer Life Brigade were handed £163,000, too - as was the Library Campaign; and she celebrated her 80th birthday in 1986 by donating £160,000 to various causes. And that was just the tip of the iceberg. Yes, Dame Catherine Cookson was, indeed, one of the world’s best-loved story-tellers. But she was much more than that. When she died peacefully of heart failure in her sleep on 11th June 1998, the people of the North-East had lost a living legend whose generosity knew no bounds. Her husband of almost 60 years, Tom, followed her to the grave less than three weeks later, on 29th June 1998, aged 86.